All professional societies provide a class I indication for revascularization in patients with CLI that is deemed ambulatory and functional with viable limb.5,6 Despite these clear guidelines, more than half (54%) of patients with CLI who underwent major leg amputation did not have any vascular interventions in the year prior to amputation, per an analysis of the Medicare database.7 Every viable patient with CLI should be considered for angiography and revascularization via endovascular or open techniques. The important concepts discussed in the following sections aim to further optimize and personalize revascularization, so that every patient can achieve optimal perfusion after revascularization to allow rapid wound healing and limb salvage. Figure 1. The below-knee skin and tissue are supplied by three main arteries and six angiosomes. The anterior tibial artery supplies the anterior shin and dorsum of the foot, the posterior tibial artery supplies the medial heel and the medial and lateral plantar angiosomes, and the peroneal artery supplies the lateral aspect of the heel and the lateral border of the foot. Reprinted from JACC, Vol 68, Shishehbor MH, White CJ, Gray BH, et al, Critical limb ischemia: an expert statement, 2002–2015, Copyright 2016, with permission from Elsevier. The TransAtlantic Inter-Society Consensus guidelines document on the management of PAD recommends obtaining straight-line flow to the foot in order to consider a revascularization successful.6 However, in recent decades, emerging data have highlighted the concept of angiosomes in revascularization. Angiosomes are connected through collaterals and allow adequate perfusion through collaterals in the absence of direct flow. The below-knee territory is supplied by three main arteries—anterior tibial, posterior tibial, and peroneal artery—that perfuse six angiosomes in the distal lower extremity (Figure 1).8 It is thought that revascularization tailored toward the wound-related angiosome will allow earlier healing by providing direct blood flow. For tissue loss, it is essential to reestablish pulsatile flow to the wound for proper, rapid wound healing. Particularly for infrapopliteal arteries, where an extensive web of collaterals exists to supply the distal foot, the need for multivessel revascularization is questionable. However, the number of patent arteries after revascularization was a predictor of functional limb salvage at 1, 5, and 10 years in a study performed in the Czech Republic, in which the authors recommended making every effort to revascularize as many arteries as possible to improve clinical outcomes.15 Others do not support the concept of multivessel below-knee revascularization.16 For example, an analysis of the OLIVE registry noted improved clinical outcomes in terms of amputation-free survival and limb salvage in patients who only had one straight-line flow into a patent pedal arch, with a trend toward a higher wound healing rate.4 Collectively, the volume of blood flow after endovascular revascularization may be limited by recoil and endothelial dysfunction. Proper sizing of angioplasty balloons and prolonged inflation may help to address some of these limitations. Ultimately, more blood flow is likely better, but is it necessary and at what cost? Patients with CLI and below-knee disease tend to have significant kidney disease. Furthermore, multivessel revascularization is more time consuming, less efficient, and more costly. Therefore, better tools are needed to guide the operator as to whom would benefit most from multivessel revascularization. In our practice, we usually revascularize the simplest, most efficiently recanalizable artery. We then carefully perform angiography of the foot. If poor wound blush or diminished collateral flow is present, we would consider revascularization in additional tibial arteries. In the near future, we hope to have better tools that can more objectively guide our therapy intraprocedurally. Revascularization beyond the ankle to include pedal arch reconstruction has been emerging and is being adopted, as this does not only improve wound blush but was shown to improve wound healing rates and reduce time to wound healing.2,17 Most data related to pedal arch disease indicate poor healing and a higher amputation rate if not patent.4 However, some of the available data have shown that pedal arch revascularization leads to faster wound healing or lower amputation rates. There is concern that aggressive pedal arch angioplasty may be associated with high occlusion rates. Collectively, most experts recommend a more conservative approach to the pedal arch with minimal manipulation. Hence, in our practice, we only consider pedal arch revascularization in select patients with distal forefoot disease and poor collateral flow to this area. Occasionally, we may use the pedal arch as a collateral vessel for retrograde revascularization of the anterior or posterior tibial arteries. However, in these situations, we protect the pedal arch with a support catheter and never dilate the arch. In the United States, multiple providers treat patients with CLI, and frequently, interventionalists perform little of the follow-up for wound care. As a consequence, there is significant delay in getting patients back to the interventionalist when wounds are not healing. With below-knee disease, surgical options are frequently limited due to the lack of adequate targets, absence of a venous conduit, limited patency of femoral-infrapopliteal bypass, and patient comorbidities.19 In our practice, the decision to pursue surgical versus endovascular options is addressed early on in a multidisciplinary team model. Should the reintervention path be selected, subsequent interventions are, by default, performed endovascularly because morbidity is far lower with repeat angioplasty compared to bypass. It is important to stay cognizant that outcomes for CLI interventions should first focus on wound healing rather than vascular patency. Ultimately, 25% to 30% of patients with CLI require repeat revascularization, and this should be done in a timely fashion. Often, the challenge is to balance the difference between “angiosomal need” and “angiographic target.” Angiosomal need is the artery that provides direct flow to the ischemic tissue, whereas angiographic target is the artery with lesion(s) that is most likely to be successfully revascularized and provides flow to the ischemic tissue directly or indirectly. The management of CLI remains a challenge to the medical and surgical community despite recent technical advancements (see the Pearls and Pitfalls of Revascularization Decision-Making in Patients With CLI sidebar). It remains important to define successful interventions by selecting meaningful outcomes (ie, wound healing) to work toward and to practice in a multidisciplinary model that provides holistic care to our patients. Ideally, each revascularization approach should be personalized, based on the patient’s clinical and angiographic characteristics and the operator’s and institution’s level of expertise. 1. Bosanquet DC, Glasbey JC, Williams IM, Twine CP. Systematic review and meta-analysis of direct versus indirect angiosomal revascularisation of infrapopliteal arteries. Eur J Vasc Endovasc Surg. 2014;48:88-97. 2. Nakama T, Watanabe N, Kimura T, et al. Clinical implications of additional pedal artery angioplasty in critical limb ischemia patients with infrapopliteal and pedal artery disease. J Endovasc Ther. 2016;23:83-91. 3. Meyer A, Schinz K, Lang W, et al. 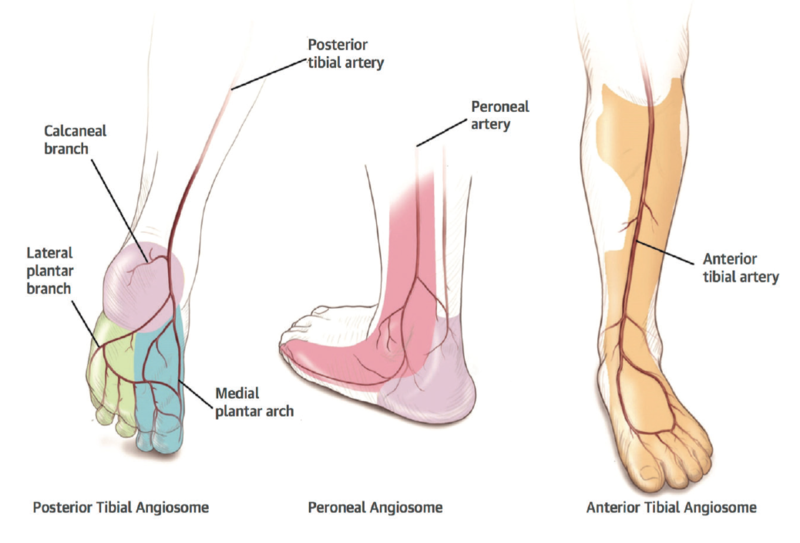 Outcomes and influence of the pedal arch in below-the-knee angioplasty in patients with end-stage renal disease and critical limb ischemia. Ann Vasc Surg. 2016;35:121-129. 4. Higashimori A, Iida O, Yamauchi Y, et al. Outcomes of one straight-line flow with and without pedal arch in patients with critical limb ischemia. Catheter Cardiovasc Interv. 2016;87:129-133. 5. Hirsch AT, Haskal ZJ, Hertzer NR, et al. ACC/AHA 2005 practice guidelines for the management of patients with peripheral arterial disease (lower extremity, renal, mesenteric, and abdominal aortic): a collaborative report from the American Association for Vascular Surgery/Society for Vascular Surgery, Society for Cardiovascular Angiography and Interventions, Society for Vascular Medicine and Biology, Society of Interventional Radiology, and the ACC/AHA Task Force on Practice Guidelines (Writing Committee to Develop Guidelines for the Management of Patients With Peripheral Arterial Disease): endorsed by the American Association of Cardiovascular and Pulmonary Rehabilitation; National Heart, Lung, and Blood Institute; Society for Vascular Nursing; TransAtlantic Inter-Society Consensus; and Vascular Disease Foundation. Circulation. 2006;113:e463-654. 7. Goodney PP, Travis LL, Nallamothu BK, et al. Variation in the use of lower extremity vascular procedures for critical limb ischemia. Circ Cardiovasc Qual Outcomes. 2012;5:94-102. 8. Shishehbor MH, White CJ, Gray BH, et al. Critical limb ischemia: an expert statement. J Am Coll Cardiol. 2016;68:2002-2015. 9. Rashid H, Slim H, Zayed H, et al. The impact of arterial pedal arch quality and angiosome revascularization on foot tissue loss healing and infrapopliteal bypass outcome. J Vasc Surg. 2013;57:1219-1226. 10. Azuma N, Uchida H, Kokubo T, et al. Factors influencing wound healing of critical ischaemic foot after bypass surgery: is the angiosome important in selecting bypass target artery? Eur J Vasc Endovasc Surg. 2012;43:322-328. 11. Utsunomiya M, Nakamura M, Nakanishi M, et al. Impact of wound blush as an angiographic end point of endovascular therapy for patients with critical limb ischemia. J Vasc Surg. 2012;55:113-121. 12. Iida O, Soga Y, Hirano K, et al. Long-term results of direct and indirect endovascular revascularization based on the angiosome concept in patients with critical limb ischemia presenting with isolated below-the-knee lesions. J Vasc Surg. 2012;55:363-370.e5. 13. Bunte MC, Shishehbor MH. Angiosome-guided intervention in critical limb ischemia. Interv Cardiol Clin. 2017;6:271-277. 14. Shishehbor MH, Reed GW. Personalized approach to revascularization of critical limb ischemia. Circ Cardiovasc Interv. 2014;7:642-644. 15. Peregrin JH, Koznar B, Kovác J, et al. PTA of infrapopliteal arteries: long-term clinical follow-up and analysis of factors influencing clinical outcome. Cardiovasc Intervent Radiol. 2010;33:720-725. 16. Kawarada O, Yasuda S, Nishimura K, et al. Effect of single tibial artery revascularization on microcirculation in the setting of critical limb ischemia. Circ Cardiovasc Interv. 2014;7:684-691. 17. Troisi N, Turini F, Chisci E, et al. Impact of pedal arch patency on tissue loss and time to healing in diabetic patients with foot wounds undergoing infrainguinal endovascular revascularization. Korean J Radiol. 2018;19:47-53. 18. Reed GW, Young L, Bagh I, et al. Hemodynamic assessment before and after endovascular therapy for critical limb ischemia and association with clinical outcomes. JACC Cardiovasc Interv. 2017;10:2451-2457. 19. Gentile AT, Lee RW, Moneta GL, et al. Results of bypass to the popliteal and tibial arteries with alternative sources of autogenous vein. J Vasc Surg. 1996;23:272-279; discussion 279-280.